Police Minister Bheki Cele on Thursday said the task team investigating political killings in KwaZulu-Natal has to date made 161 arrests. Cele was briefing the media at a conference in Durban on progress made since the task team was appointed in July last year "to resolve the shockingly slow progress on more than 132 murder investigations in the province". An inter-ministerial committee (IMC) was appointed by President Cyril Ramaphosa and met for the first time on May 21 last year, where it was presented with the unresolved cases. "To date, out of 163 case dockets – 80 counts for murder, 24 for attempted murder, 36 for intimidation, and other charges – a total of 161 arrests have been effected by the task team," Cele said. Out of these arrests, 25 suspects were detained for questioning and released, 136 suspects were charged, 66 suspects were taken into custody, 32 suspects were currently out on bail, 27 had been convicted, two suspects were deceased, five had received life sentences and 22 had been given sentences ranging from six months to 50 years. "While we consider these successes of 163 cases to be very significant, it is even more encouraging to note that, from 163 case dockets, 52 dockets [have been finalised]." According to Cele, 59 cases are currently pending in court, 52 case dockets are still under investigation and 27 cases have led to convictions. "On six of the 59 cases currently pending in court, charges have been provisionally withdrawn against some of the identified suspects. 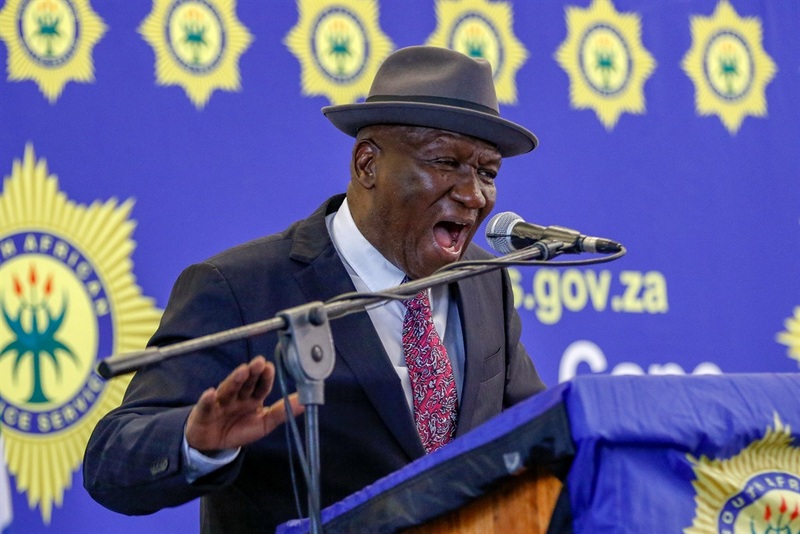 Among the six cases that have been provisionally withdrawn, some suspects have been re-arrested and their cases have been enrolled in different courts," Cele said. According to Cele, the task team has made arrests relating to several high-profile murders such as those of Sindiso Magaqa, Londiwe Mhlongo, Derick Mthethwa, Wandile Ngobeni, Sibuyiselo Dlamini, Qashana Mchunu and Sibusiso Mbhobo. "There are investigations [being] conducted by the task team [relating to the] murders of the chief traffic officer of Umvoti municipality (Thobani 'TM' Ndaba, who was killed in November last year), the director of Alfred Duma municipality (Oscar Hlatshwayo) and the murder of a traffic officer and two others in Plessislaer (Sifiso Gwala of Imbali Unit 2, Nhlanhla Zibula and Nathi Zondi)." In addition, a number of firearms and ammunition had been confiscated, Cele said. "All firearms have been sent for ballistic tests. Three have been linked positively to murder cases under investigation by task team." Cele said 77 case dockets not related to the task team's mandate, but that have been linked with politically related cases, were taken over by the task team for parallel investigations. Out of the 77 registered cases, 56 are already before the court while 21 are still under investigation. "Over and above the allocated and parallel politically related cases, the task team is conducting intelligence-driven operations targeting unlicensed firearms which have led to 37 arrested suspects on 31 cases and 30 firearms were recovered. These two categories of cases are also allocated to the task team to ensure centralised investigation and prosecution," Cele said. Cele said the task team has clamped down on private security companies within the province and commits to "continuously conduct operations against identified private security companies". A number of security companies had been inspected and firearms were confiscated and sent for ballistic testing. "Owners or responsible persons of companies have been arrested and charged," Cele said. "A total of 13 cases have been opened and 14 suspects arrested and charged in terms of Firearms Control Act and PSiRA regulations, and 377 firearms from the eight private security companies have been sent for ballistic testing. Firearms will be returned to owners upon completion of investigation or, if declared unfit, firearms will be destroyed and affected companies will be dealt with in terms of relevant legal prescripts." Cele said it was imperative to make it clear that the task team was investigating political killings in KwaZulu-Natal, where politicians have been killed. "At times, some of the suspects are politicians, which makes the entire execution of the task team mandate to trigger political fireworks. "Unfortunately this has been misconstrued as being meddling in political factionalism of political parties using State apparatus. It must be emphasised that the investigation and subsequently prosecutions of these cases are done in accordance with the rule of law and ideas enshrined in our Constitution," Cele said. The minister said the inter-ministerial committee "remained committed in delivering to the fundamental directive by the president" to "address the scourge of political killings". Furthermore, he added that the IMC will continue to provide support to the multidisciplinary task team that is currently executing its mandate in KwaZulu-Natal. "The progress made to date by the task team is highly commendable and evident of the commitment to serve with integrity without fear or favour and prejudice," Cele concluded.